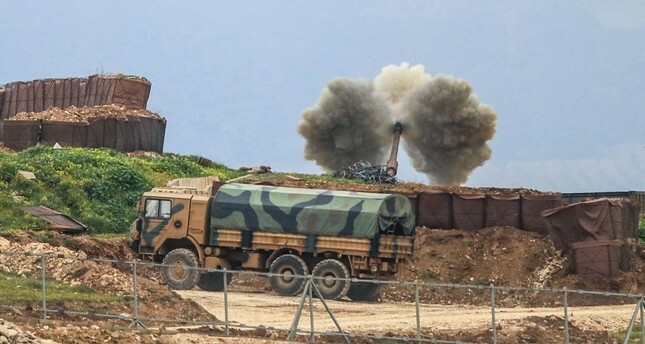 The Turkish military struck the PKK's Syrian affiliate People's Protection Units (YPG) positions in north Syrian cities of Azaz and Mare with howitzers on Sunday, reportedly killing a number of terrorists. It has been reported that on Saturday night, there was a conflict between YPG terrorists – who invaded the territories in southern Azaz and southern and western Mare – and the Turkey-backed Free Syrian Army (FSA). Separately, a Free Syrian Army (FSA) member was killed, and three others injured in a clash with YPG/PKK terror group on Saturday night. Following the encounters, the Turkish military conducted more than 20 howitzer strikes on the YPG positions. As a result of the strikes, it's reported that scores of terrorists have been killed. For the last three years, Tal Rifat has been occupied by the YPG/PKK, which has dubbed the territory between Tal Rifat and Manbij as the "Shahba Canton." The YPG/PKK occupied Tal Rifat in 2016 in hopes of linking Afrin, a city in northwestern Syria, to areas under its control east of the Euphrates River, thus establishing a zone of influence along Syria's border with Turkey. Syria's Al-Bab district, however, which is located between Tal Rifat and Manbij, falls within Operation Euphrates Shield's area-of-operations, thus disrupting the YPG/PKK's sought-for territorial link. Later in January 2018, Turkish military and FSA elements launched Operation Olive Branch to clear Afrin district from terrorist groups, liberating the town center in March. Some 250,000 refugees from Tal Rifat and its outskirts have taken up temporary residence in the opposition-held city of Azaz, located adjacent to the Euphrates Shield zone. In its more than 30-year terror campaign against Turkey, the PKK -- recognized as a terrorist group by Turkey, the U.S., and the EU -- has been responsible for the deaths of some 40,000 people. The YPG/PYD is the group's Syrian branch.